Michael Anderson, who directed such films as The Dam Busters (1955), Around the World in 80 Days (1956), and The Quiller Memorandum (1966), died April 25 2018 at the age of 98. 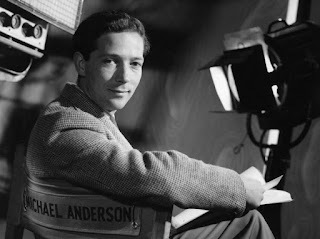 Michael Anderson was born on January 30 1920 in London. He came from a theatrical family. His great aunt was stage actress Mary Anderson (who was billed as Mary Navarro during her career in silent films). His parents were stage actors Lawrence and Beatrice Anderson. It was through acting that his career in film began. He appeared as an actor in the film Housemaster (1938). Afterwards he served as an assistant director on such films as Spy for a Day (1940), Freedom Radio (1941), Jeannie (1941), and Unpublished Story (1942). He appeared as an actor in the film In Which We Serve (1942). During World War II Mr. Anderson served in the Royal Signal Corps. It was during this time that he met actor Peter Ustinov. The two co-wrote what would be the first film on which Michael Anderson had credit as director, Private Angelo (1949). Following the war Michael Anderson served as assistant director on such films as Fame is the Spur (1947), Vice Versa (1948), One Night with You (1948), and Woman Hater (1948). As mentioned above, his first film as director was Private Angelo (1948). He also directed the film Waterfront (1950). In the Fifties Michael Anderson directed the films Hell is Sold Out (1951), Night Was Our Friend (1951), The House of the Arrow (1953), Will Any Gentleman...? (!953), The Dam Busters (1955), 1984 (1955), Around the World in 80 Days (1956), Yangtse Incident: The Story of H.M.S. Amethyst (1957), Chase a Crooked Shadow (1959), Shake Hands with the Devil (1959), The Wreck of the Mary Deare (1959), and All the Fine Young Cannibals (1960). The Dam Busters, based on the true story of the RAF's 617 Squadron's attacks on the Möhne, Eder, and Sorpe dams during World War II, was both critically acclaimed and the biggest British film at the box office in the United Kingdom for the year 1955. Around the World in 80 Days was the second highest grossing film of 1956 (after the juggernaut that was The Ten Commandments). It earned Michael Anderson an Oscar nomination for Best Director and won the Oscars for Best Picture; Best Cinematography, Colour; Best Film Editing; Best Music, Scoring of a Dramatic or Comedy Picture; and Best Writing, Best Screenplay, Adapted. In the Sixties Michael Anderson directed The Naked Edge (1961), Flight from Ashiya (1964), Wild and Wonderful (1964), Operation Crossbow (1965), The Quiller Memorandum (1966), and The Shoes of the Fisherman (1968). In the Seventies Mr. Anderson directed Pope Joan (1972), Doc Savage (1975), Conduct Unbecoming (1975), Logan's Run (1976), Orca (1977), and Dominique (1979). He directed the television mini-series The Martian Chronicles. In the Eighties Michael Anderson directed Murder by Phone (1982), Second Time Lucky (1984), Separate Vacations (1986), La bottega dell'orefice (1988), and Millennium (1989). He directed the TV movie Sword of Gideon. In the Nineties he directed the TV movies Young Catherine, The Sea Wolf, Rugged Gold, Captains Courageous, and 20,000 Leagues Under the Sea. He directed the films Scales of Justice (1992), Summer of the Monkeys (1998), and The New Adventures of Pinocchio (1999). Michael Anderson was a very talented director. Arguably he was at his best directing war films. The Dam Busters is not only a classic of the genre, but arguably one of the greatest films ever made. Yangtse Incident: The Story of H.M.S. Amethyst and Operation Crossbow also number among Mr. Anderson's best films. Of course, he could make films in other genres. Around the World in 80 Days stands out as one of his greatest achievements (it set the records for most camera set ups, most sets, most costumes, and most people shot in separate locations worldwide). His later work in television was often better than some of his work in feature films. Mr. Anderson did have some misfires in his career, but even when a particular movie's script might not be up to par, his direction was always excellent. Paul Junger Witt, who produced such shows as The Partridge Family, Soap, and The Golden Girls, died today, April 27 2018, at the age of 77. The cause was cancer. Mr. Witt was born in New York Ciety on March 20 1943. He graduated from the University of Virginia in 1963. He was an associate producer on the short-lived sitcoms Occasional Wife and The Second Hundred Years. He was a producer on Here Come the Brides and the first season of The Partridge Family. In 1973 he left Columbia Pictures to work with Tony Thomas at Danny Thomas Productions. He also met his future wife and business partner, television writer Susan Harris. In 1975 Paul Junger Witt and Tony Thomas formed Witt/Thomas Productions. He served as an executive producer on the soap opera parody Soap and its spinoff Benson. In the Eighties he was executive producer on such shows as It's a Living, Hail to the Chief, The Golden Girls, and Beauty & the Beast. He served as a producer on the movies Firstborn (1984) and Dead Poets Society (1989). In the Nineties he served as a producer on such shows as Empty Nest, The Golden Palace, Blossom, Herman's Head, Nurses, and The John Larroquette Show. He produced the movies Final Analysis (1992), Mixed Nuts (1994), and Three Kings (1999). In the Naughts he was a producer on the movie Insomnia (2002). In the Teens he served a producer on the movie A Better Life (2011) and the TV show Beauty and the Beast. 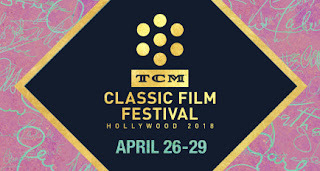 I will not be at the Turner Classic Movies Classic Film Festival this year, although I really wish that I could have gone. That having been said, I have plenty of friends who are going and I do hope all of them have a wonderful time. I am looking forward to the many blog posts and many posts on social media from the festival. 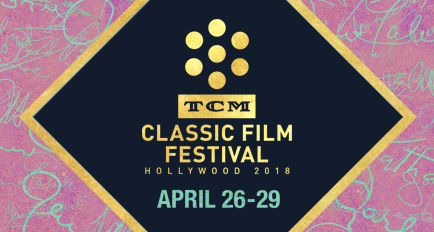 Some time next week I will make a post with links to all of the blog posts on this year's TCMFF! Maybe next year I can actually make it to the festival! John Stride, who starred as solicitor David Main on the TV show The Main Chance and appeared in such movies as A Bridge Too Far (1977), died on April 20 2018 at the age of 81. John Stride was born on June 11 1936 in London. He won scholarships to Alleyn’s School in Dulwich, where he discovered acting. Against this parent's wishes, he attended the Royal Academy of Dramatic Art. He made his professional debut on stage in 1957 in Look Back in Anger at Liverpool Playhouse. He made his debut on the West End in Five Finger Exercise in 1959. Later in the year he appeared at the Old Vic in As You Like It, Richard II, and Henry V. He saw success playing Romeo in Franco Zefirrelli's stage version of Romeo and Juliet, playing opposite Dame Judi Dench as Juliet. On Broadway he appeared in Macbeth, played Romeo again in Romeo and Juliet, and appeared in The Lady of the Camellias. John Stride made his film debut in Sink the Bismark! in 1960. In the Sixties he appeared in the movie Bitter Harvest (1963). He made his television debut in an episode of ITV Play of the Week in 1959 and that same year appeared in an episode of Rendezvous. He starred in the TV series The Scarlet and the Black and on the TV series The Main Chance. He guest starred on such shows as Knock on Any Door, Love Story, Thirty-Minute Theatre, Detective, The Root of All Evil?, BBC Play of the Month, W. Somerset Maugham, and ITV Saturday Night Theatre. He was a storyteller on Jackanory. In the Seventies he continued to star on The Main Chance and later in the decade starred on the TV show Wilde Alliance. He guest starred on such shows as Once Upon a Time, Heil, Caesar!, Play for Today, and ITV Playhouse. He appeared in the mini-series Love Among the Artists. He appeared in the films The Tragedy of Macbeth (1971), Something to Hide (1972), John Keats: His Life and Death (1973), Juggernaut (1974), Brannigan (1975), The Omen (1976), A Bridge Too Far (1977), and Oh Heavenly Dog (1980). In the Eighties he starred in the TV show Diamonds. He appeared on such shows as Lytton's Diary, Agatha Christie's Poirot and TECX. He appeared in the mini-series Number 10, Imaginary Friends, and Chelworth. He appeared in the film Hanna's War (1988). In the Nineties he starred on the TV show Growing Rich. He appeared on the TV shows The Mixer and Alleyn Mysteries. He appeared in the mini-series The Old Devils. John Stride was a very talented actor. This can be seen in his performance as David Main, the solicitor whose nonchalant attitude is at odds with his more constrained partner in Leeds, in the TV show The Main Chance. Over the years he played a number of roles that were quite different from David Main, including Alun Weaver in The Old Devils, Henry VIII in the TV movie The Famous History of the Life of King Henry the Eight, Keats in the film John Keats: His Life and Death, and Malcolm on stage in Macbeth. He was both versatile and capable of giving great depth to the various characters he played. Naomi Stevens, the actress who played Mrs. Dreyfuss in The Apartment (1960) and had recurring roles on shows from The Flying Nun to The Doris Day Show, died on January 13 2018 at the age of 92. Naomi Stevens was born on November 29 1925 in Trenton, New Jersey. She made her television debut in 1956 on an episode of Medic. In the Fifties she appeared on such TV shows as Lux Video Theatre, Cheyenne, Whirlybirds, Playhouse 90, The Californians, Bronco, The Twilight Zone, and Bonanza. She made her movie debut in The Black Orchid in 1958. In 1960 she appeared as Mrs. Mildred Dreyfuss, the wife of Dr. Dreyfuss and C. C. Baxter's neighbour, in The Apartment. In the Sixties Naomi Stevens had recurring roles on Dr. Kildare, The Flying Nun, The Doris Day Show, and My Three Sons. She guest starred on The Lawless Years, The Detectives, Have Gun - Will Travel, McHale's Navy, Rawhide, 77 Sunset Strip, The Alfred Hitchcock Hour, Wagon Train, The Jack Benny Program, The Big Valley, My Favourite Martian, The Man From U.N.C.L.E., Hogan's Heroes, That Girl, Adam-12, and Room 222. In the Sixties she appeared in such films as Convicts 4, The Art of Love (1965), Frankie and Johnny(1966), Valley of the Dolls (1967), The Shakiest Gun in the West, and The Hawaiians (1970). In the Seventies Naomi Stevens was a regular on The Montefuscos and Vega$. She guest starred on such shows as The Odd Couple; Nanny and the Professor; The Partridge Family; Love, American Style; The F.B.I. ; Cannon; Ironside; Kolchak: The Night Stalker; and Barney Miller. She appeared in such films as Fly Me (1973), Superdad (1973), Hard Times (1975), and Hustle (1977). In the Eighties she guest starred on such shows as Taxi, Hotel, Trapper John M.D., and Duck Factory. Naomi Stevens was a wonderful actress. Through the years she mostly played ethnic mothers or motherly types, although she did on occasion play other sorts of roles. She was Sister Teresa on The Flying Nun and police Sgt. Bella Archer on Vega$. In the TV movie The Old Man Who Cried Wolf she played a woman who is convinced that a man whose friend was killed in an attack is crazy. While Naomi Stevens mostly played mother figures in her career, she was quite capable at playing other roles as well.